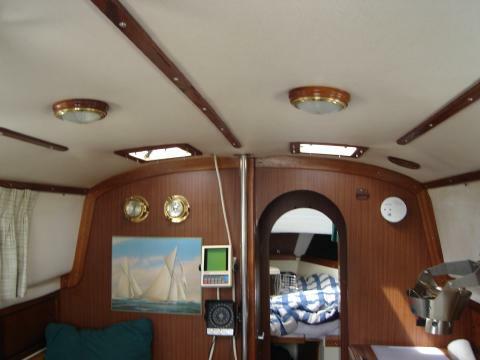 Cabin headliners are a problem on older boats. The "fixes" that have been used or suggested are legion. Drinian's cabin has been shrinking as the headliner sagged into the cabin space. _ The previous owner had pulled the liner out of the forward cabin and left a mess of dried glue and black powder that had once been the foam backing. 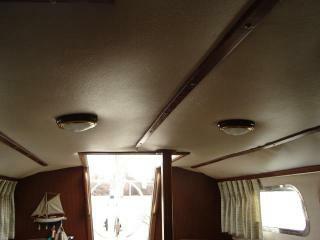 _ I had dealt with that problem by using solvents to wash down the v-berth and then sealed the mess with several coats of paint. _ Needless to say, I did not want to face a bigger mess in the main cabin, nor would I be happy with the odd texture of painted fiberglass overhead. ____Ah, the joys of standing headroom! _ The new lights also help anchor the "fix" and replaced the old fluorescents (which hadn't worked as long as I have had the boat).